Having built a representation of the county council election results from data scraped from the Warwickshire Web, I wanted to add maps to it. Especially as the Ordnance Survey have not long released their Boundary Line dataset which contains a whole bunch of boundaries including the county electoral divisions. I wasn't quite sure what I wanted to end up with - as a start, an outlined map of the area in each division page would be a start. Just to say I know very little about GIS or geodata generally - I've plotted some points on Google Maps previously, but that's about as far as I've gone before this project. So with that, if I've misrepresented anything or got anything badly wrong, do let me know. 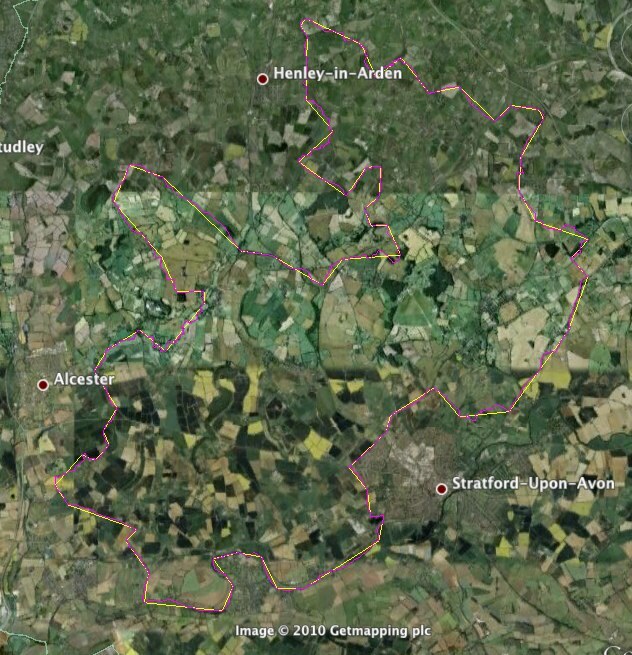 Just to say that this work relies on the Boundary Line dataset provided as open data by Ordnance Survey. Here's the copyright notice, and there's more info on their licencing page. 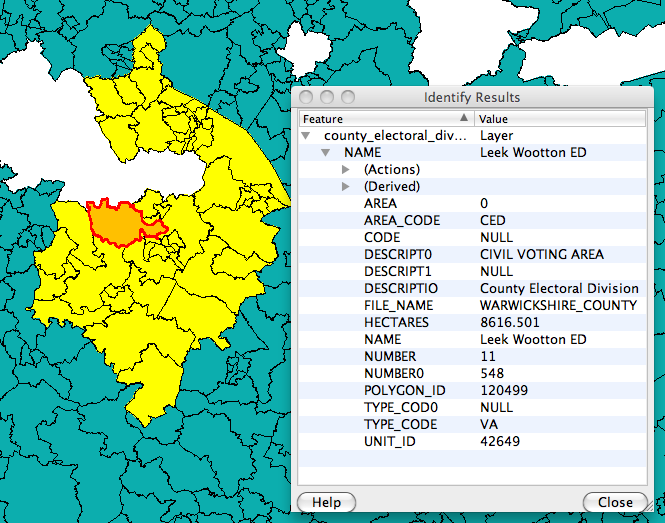 The county electoral division dataset comes in a 46MB ESRI Shapefile, which is a pretty standard format for this kind of data. It contains all of the polygons for the county councils across England - as I'm only after the Warwickshire stuff, I'll need to chuck most of that away. Here's a representation of the shapefile in Quantum GIS, which can read ESRI Shapefiles. 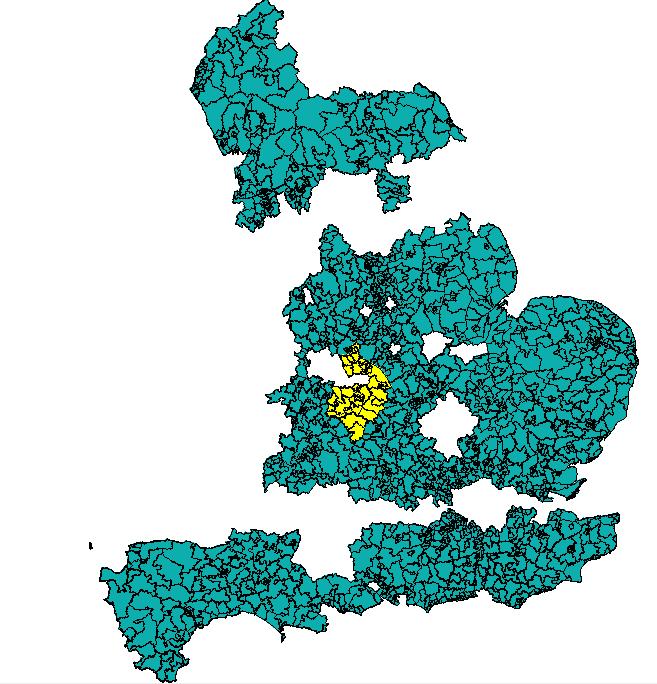 Warwickshire is picked out in yellow. I had a vague idea about getting the shapefile converted into KML so I could chop it down to size and manipulate it. Something I learned early was that the data in the shapefile is in eastings and northings - KML needs latitude and longitude. Which is great and all, but it's still a shapefile. Luckily there's also a command for turning .shp files into .kml. So from a 46MB shapefile, we end up with a 108MB KML file. The co-ordinate pairs also seem to be in long,lat format, rather than lat,long - and each pair is separated by a space. Also as part of this data we have styling info, which I'm sure was done for good engineering reasons but I'd wonder if that's best separated out. Anyway. At first glance the KML file seemed to lose the link to the .dbf file, meaning that I wasn't sure which shape related to which electoral division. The .dbf file can be opened in Excel, and eventually I worked out that the FID value in the KML was the same as the row number (starting from zero) of the electoral division in the .dbf file. Row numbers start from 1 in Excel, so to save my addled brain I added a new column in the Excel file numbering the rows from zero. After a while I'd managed to chop the original 108 MB KML file down to 3 MB. TextWrangler (and possibly big brother bbedit) seems to be the only Mac OS X text editor that can handle that size of file without dying, by the way - beloved TextMate just seems to hang. So once I had the KML file, what to do next. 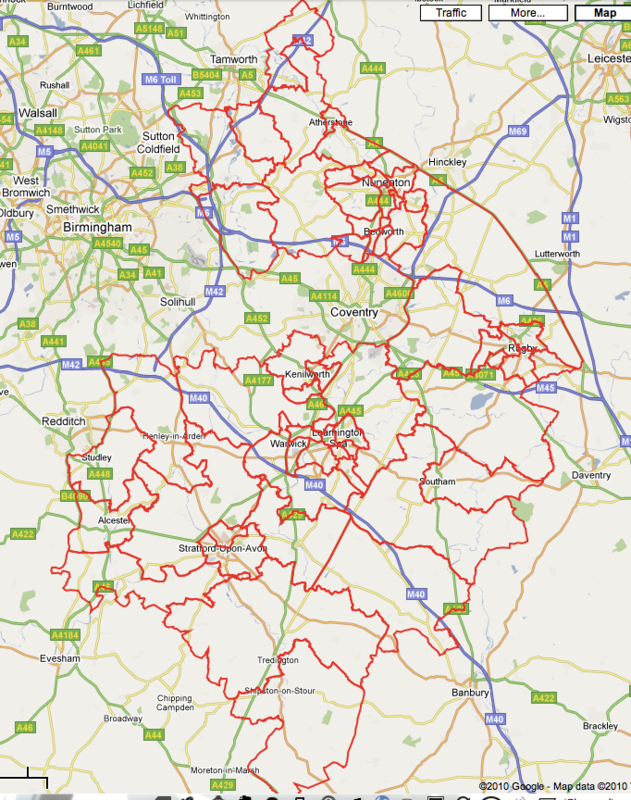 I really wanted to link the electoral division geography with my Warwickshire election data site. Ideally I'd have a PostGIS-enabled version of PostgreSQL to shove all the data into, but I haven't. Some desperate scanning round the web produced the revelation that MySQL can store polygons as binary data, it's just that it can't do very much with them. For now I decided to put it all into the MySQL database, using the simplexml library within PHP. This was also a chance to tweak the precision of the points - the dataset has the points stored down to 16 or 17 decimal places, but our intended destination Google Maps can only deal with about 6 decimal places, so I rounded off the point co-ordinates as I loaded them into the database. From reading around later on, it seems I've gone the long way around this - it seems that ogr2ogr should be able to load data from a Shapefile directly into a MySQL database. If nothing else, I've got myself a KML import script which could be handy. Counting up all the points in the Warwickshire subset of the datasets gives us (deep breath) 81624 points. Which is quite a lot. Given the slow performance of the rendering of the dataset within Quantum GIS, I had decided to try and simplify the polygons for display on the web. Some reading around brought up the recommendation of the Douglas-Peucker algorithm - here's a demo of it in action by Anthony Cartmell - here's his PHP implementation of the algorithm. The pink colour is a pretty poor choice to demonstrate this, but hopefully it'll make sense - here's a simplified version of the Aston Cantlow electoral division - the pink line has 813 points, the yellow line has 74 points. Here's a link to the KML in Google Maps, with 6647 points - notice on the left that the areas aren't labelled, yet. After all that, I did an export of the dataset at 99% of the points in the full version, resulting in a 1.8 MB KML - this is what I get, which still works quickly in Mac OS X Safari, and was actually OK in IE7 too. I was interested that IE could cope with this many points - it made me wonder if something was being done Google server side to smooth the points out at a particular zoom level. I also wrote a variation on this to output back to the database rather than out as a KML file - this meant I could quickly experiment with different generalisations of the data to check performance. The info as to which shape is which area is stored in the associated .dbf file - I'd converted it earlier to a CSV file, so I wrote a routine to compare the titles of the electoral divisions in the database against the titles of the areas in the CSV; not perfect, but good enough. Once I knew which shape was which, I could then associate the election data against it, and build a map. Created a row in the areas table for simplified versions of the polygon - went for setting 4000 on my simplifier program which meant 8186 points, 10% of the size of the original. Somehow I must've had too much time to myself - here's a comparison of the speed differences between the original and simplified map in Mac OS X Safari 4.0.5.